I’ve been looking around for a decent pair of workout headphones to use with my iPhone for a while now. My old workout headphones were not really sports headphones and they had no iPhone remote either. And so I found a promising model from Sennheiser called OMX680i which are at writing moment a fairly new model. I have good trust in Sennheiser since before and with the price tag just below €45 I bought a pair without even listening to them first. The OMX680i has a clip-on construction that holds them securely onto your ears while you do your work out. The clip-on construction is fully adjustable to your ears and is actually surprisingly comfortable. Even though the OMX680i is adjustable and a “one size fits all” construction, they will not sit securely onto smaller woman ears or kids ears but are most optimal for average size male ears. I would really like to see a female/kids version of this headset and also different colors in alternative to this ugly yellow version. The headset has a fully iPhone-compatible microphone and remote control with play, pause, volume and answer call button. The functional highlights are durability and toughness, resistance to sweat and water and apparently you can even rinse them under running water. I really like that you get them with a nice protective pouch to store them in while you have them in your gym bag, which prevents tangling the cord. The sound characteristics are straight forward and open but with a tendency to be a bit bright. To suit my taste I had to activate the built in EQ in the iPhone and reduce the treble slightly. Frequency response in general feels fairly linear but they lack a lot of authority in the bass segment where they almost sound a bit weak. The bass response I guess can be adjusted for better or for worse with any of the 4 pairs supplied ear sleeves and air cushions, which I did not test yet. Over all the sound is decent considering the price, the features and the functionality of the headset. And to be honest, nobody do critical high fidelity music listening while working hard at the gym. 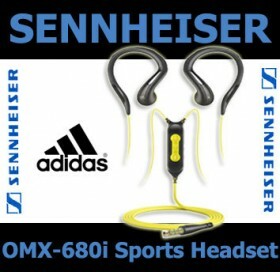 I think the Sennheiser OMX680i Sport covered exactly what I was looking for and I can really recommend them.